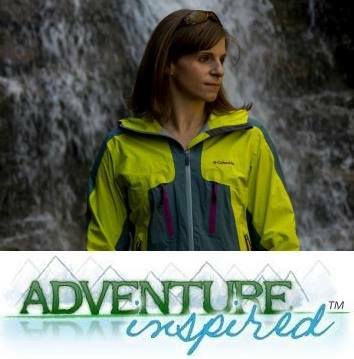 I'm proud and excited to feature Justin Johnsen as Adventure-Inspired's first ever guest blogger! Hope you enjoy his take on this year's Red Rock Rendezvous. 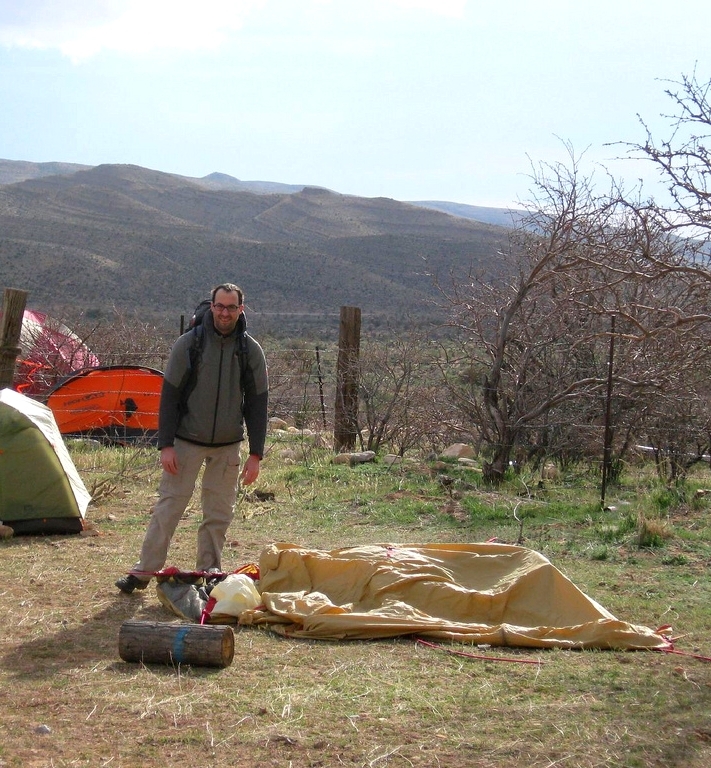 I’d heard about the Red Rock Rendezvous for years, but this time, my friend Brett’s enthusiasm from his 2010 Rendezvous was infectious. Philly friend Frank and I signed up to go and made plans to meet Brett at the event. I tried to recruit a few folks including Priya who had relocated to Washington D.C. from Philadelphia. It was to be a rendezvous indeed! When Katie realized she couldn’t go, she recruited me to write about the Rendezvous. With a gonzo journalism assignment like this to Las Vegas, I wanted to roll out like Hunter S. Thompson. But our lack of budget limited me to vodka and tonic as a chemical prelude, and thus passed the flight west. 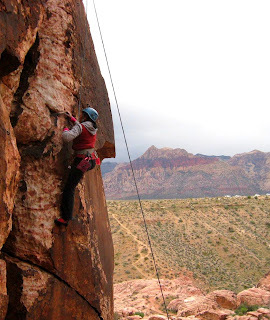 On Friday, we stopped at Calico Basin for a warm up climb at Cow Lick Crag. Changing into our climbing clothes, the city was gone from our eyes and minds for the duration of the festival. We were at the edge of the wilderness, albeit a heavily populated one; a thousand attendees would be there for the Rendezvous in addition to the usual visitors. We spent the necessary fifteen minutes in overloaded awe of the beautiful scrambled sandstone landscape of the Calico Hills, an experience I have each time I come here. As I lined up draws on my harness, I had a flashback to the first time the three of us tried to climb outside together on our own. Merely two years ago, I had become confident enough to set up top rope anchors at High Rocks, Philadelphia’s largest local crag. Despite rain falling all night, we drove almost an hour to find a (legal) campsite, slept in the weather, and were rebuffed from climbing by the weather. 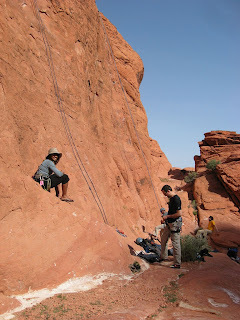 Now here we were at a world class desert sandstone sport climbing destination, ready to hit the rock on our own. What a milestone in our climbing lives and in our friendship. We climbed Cow Lick Co., an easy, slabby 5.7. Frank and I took turns leading and Priya followed on toprope, all the while lamenting that she hadn’t learned to lead yet. Interestingly, she won a set of five top end quickdraws from Trango in their post-Rendezvous contest on Facebook; I know she’ll be leading on those soon! We chatted with climbers from far and near at the crags. One person warned us the campsites were filling up, so we hustled out after one round of climbs. Fortunately, this was bad beta. 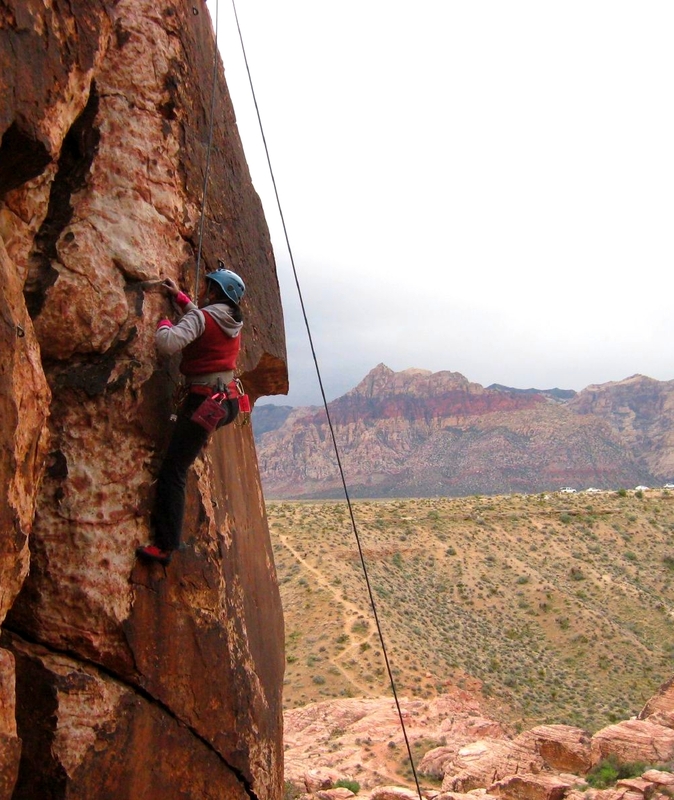 We drove past Red Rock Canyon National Conservation Area to Spring Mountain State Park, the scene of every bit of the festival except the climbs. 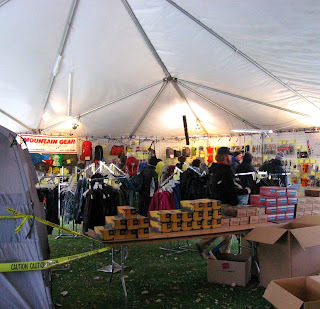 There was ample space; two or three times the number of tents on site could have fit comfortably. Although, I’d guess many more would have been flattened by the gusting 60 mph winds. Fun, Food, Beer and Gear! Both Rendezvous nights were quite similar. Festival attendees focused on a stage where renowned climbers played slide shows and told stories of the year’s feats, and the event’s sponsors gave presentations and thanks. Each attendee got a commemorative beer glass, which was freely refilled between the hours of 5 and 10 like some mythical Norse drinking horn with beer on tap from New Belgium. Valhalla! The lawn was lined tents belonging to well known climbing equipment companies. Some loaned gear for the following day’s climb; for collateral, you could test some top-of-the-line gear. Naturally the sales reps were there to talk about the virtues of their wares, but most were genuinely users of the same. By the time I figured out that I could borrow gear while looking through the Osprey and Five Ten tents, I was too tired, cold and buzzed to think about trying on shoes. I ate the food, I drank the beer and I drooled over the gear, but maintained self-control and didn’t buy any on impulse. 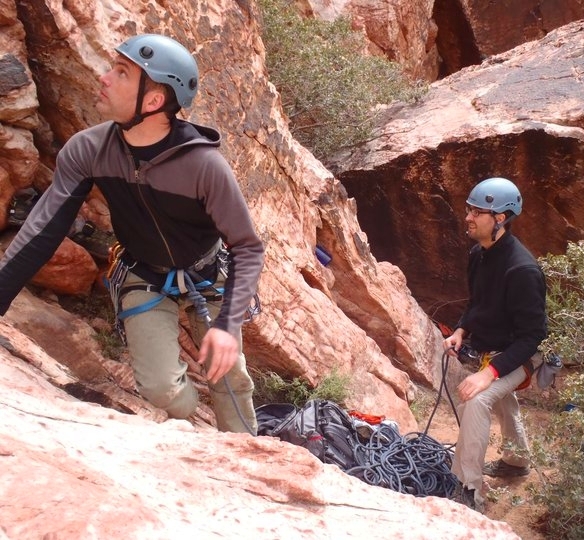 Brett and his climbing partner regaled us with stories of their multi-pitch climbs in the canyons. The party ended each night with music and dancing each night. We huddled in Frank’s four season tent, safe from the angry wind and making plans for the next day. Frank and I took a crevasse rescue class Saturday morning. This complemented a winter mountaineering class we took a couple of weeks before, and contributed to the idea of climbing Mount Rainier. A climbing friend of mine from California, BJ, was also at the clinic. I knew him from a 2008 trip I put together for Mount Williamson. Having climbed the last of California’s 14ers last year, he’s looking to Colorado’s and Washington’s tallest summits. Our instructors, American Alpine Institute guides Angela Seidling and Kristen Looper, taught us roped glacier travel, self-rescue, and rescue pulley systems. They were helpful and thorough, and kept a perfect pace for presenting such a large volume of specific information. With a practiced cadence born of experience, they broke up lectures and demonstrations with hands on activities for all of us. 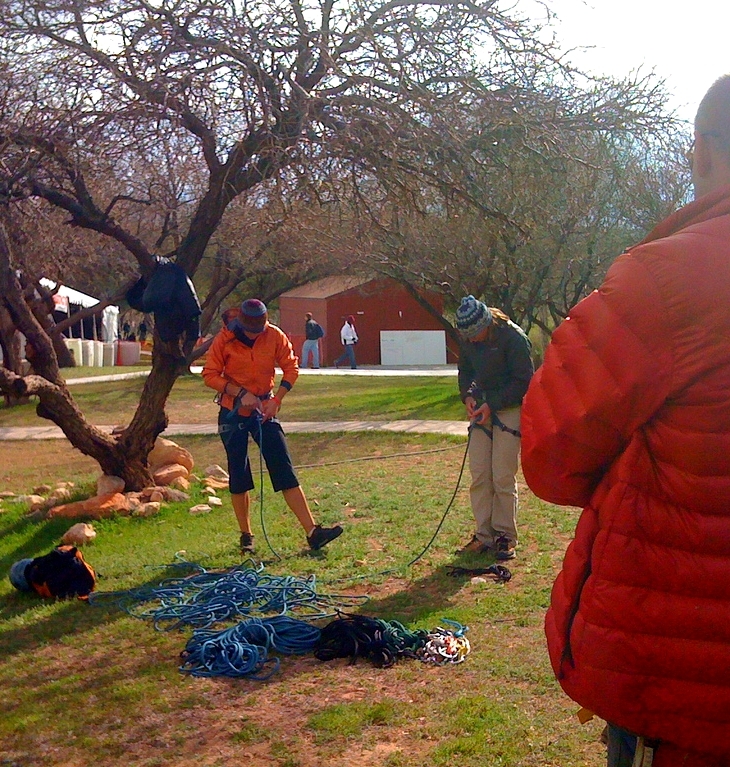 We practiced tying into a rope, ascending on prusiks and rigging pulley systems. While the desert might seem like a silly place for a glacier safety clinic, the weather did its part to get colder each morning. By the Monday after the Rendezvous ended, there was snow near the elevation we camped at. After the AAI clinic, we broke away from the festival and found our own climbs. Being accustomed to slippery Pennsylvania schist and shale, Red Rock’s sandstone was a pleasure to scramble across on the approach, and to climb to the “remote” Civilization crag. After a playful hike in, we warmed upon the Sun Never Sets (5.7) with a slabby ending, but more interesting than the prior day’s hike. Next we moved to Babylon 5.8. It gave me some real anxiety leading to the first bolt; the deck beneath was uneven and rocky, the crag was new tome, and the good holds were interspersed with hollow-ringing loose flakes. After a quick hang to get my head back on straight, the rest of the route was fun, enjoyably exposed, but not technically difficult. Soon all three of us had climbed both route and were scouting the 5.9 next to Babylon. We were cut short by heavy raindrops. Having heard horror stories of how unreliable Red Rock stone becomes after heavy rains, I feared the worst when the first drops hit. But all we had were briefly passing desert showers. Some climbs were canceled Saturday afternoon, though. As we walked back through the parking lot, I overheard one attendee say that his “How to Lead Trad” class in the canyon that afternoon turned into a “How to Bail Gracefully” class. On Sunday, we had our celebrity clinic after the free pancake breakfast. The names of our instructors weren’t provided in advance. As we got off the shuttle at Willow Springs, our “Crack Climbing” class of five combined with a “Trad Anchors” class of two. Our instructors were Sonnie Trotter, one of Canada’s best single pitch trad climbers, for crack climbing, and Kate Rutherford, just back from an alpine first ascent on Mount Fitz Roy in Patagonia, for trad anchors. Unfortunately, our crack class was assigned a crag that didn’t have a proper full-pitch crack climb. Instead, we practiced on some chest-high cracks of variable widths and still learned quite a bit. Compared to top athletes of other sports, Kate and Sonnie were free of ego. It makes me proud to be part of such a down-to-earth culture where people do this just because they love to climb, and that’s often enough to bond over. That’s what I really took away from the Red Rock Rendezvous. This is one hell of a subculture. The rebellion of the early decades of climbing is still here to some degree, but so many of the newer generations of climbers are activists for constructive causes at the same time. I see great things here for climbing, and great things ahead. The Rendezvous really plugged me into this current. Justin Johnsen is a generalist, currently working as a software developer at a Medicaid provider. His post-hippy parents shared their love of the outdoors with him in the mountains, deserts and beaches of Southern California. After moving to Philadelphia and finding no mountains, he picked up the surrogate sport of climbing, as a new excuse to spend time outside with interesting people.